In an interesting twist to what had been a post-session, pre-presidential run period of crowds chanting “Run, Rick, Run!” everywhere he has shown up, probably reminiscent of the Governor’s A&M yell leader years, Rick Perry was subtly called to task for anti-immigrant efforts during both the regular and special session of the 82nd legislature, then shunned by San Antonio Mayor Julian Castro, and left standing as dead air fell upon the room before someone stepped in to introduce the Governor as he addressed the National Association of Latino Elected and Appointed Officials (NALEO). Not a good sign from the hispanic community for someone who is considering a run for the presidency. The San Antonio Current posted this update in thier QueQue blog. 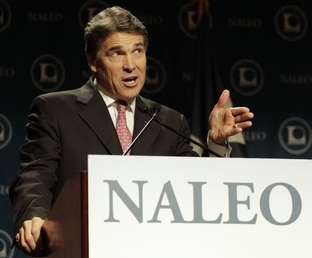 Fresh from his renewed push to dismantle so-called sanctuary cities at the Texas Lege, Governor Rick Perry addressed the National Association of Latino Elected and Appointed Officials to a subdued hostility last week. Harassed and derided by protesters on the street, Perry also took heat from none other than Mayor Julián Castro inside before reaching the podium. Referencing Perry’s effort to, not once but twice, push controversial immigration measures through the Lege, Castro said, “We’ve seen in the State of Texas the call for Arizona-type legislation. We have seen, in this legislative session, easily the most anti-Latino agenda in more than a generation, pursued without shame.” Castro left the stage without even introducing the governor. After an awkward five-minute pause, Republican convert and South Texas state Rep. Aaron Peña took to the mic, introducing Perry by praising him as a tax-cutting, experienced leader. Protesters outside Perry’s speech scoffed at his presence at the NALEO luncheon, saying it was nothing more than a move to gauge support among Latinos while pondering a White House bid. “It’s insulting for us,” said Diana Lopez, an organizer with Southwest Workers Union. “He wants to run for president, that’s why he’s here. He wants to be seen with these people.” If Perry hopes to sway Hispanics, his San Antonio reception suggests he’s got a lot of work ahead of him. New projections from NALEO released last week estimate at least 12.2 million Latinos will turn out in the next presidential election, an increase of 26 percent from 2008. And Latinos in Texas, NALEO says, are likely to account for over 20 percent of the Latino vote. If this is the response he got from hispanic leaders here in Texas, will the rest of the Latino’s in the U.S. soon be chanting “Run, Rick, Run – back home to Texas” if he pursues his candidacy for president? Click here to read about an environmental justice issue for Latinos. Justin Bieber tickets or early filing of AZ styled immigration reform . . . what to do, what to do? OMG, how excited are Texas Republicans to file their own Arizona-style immigration reform? You’d think this was the line for Justin Bieber tickets . . . NOT. . . Saturday afternoon, State Rep. Debbie Riddle pitched a make-shift campsite outside the floor of the Texas House of Representatives to make sure she was the first in line when the chief clerk’s office opened for early filing Tueday morning, spending Saturday and Sunday night sleeping on the lobby floor. Riddle, who made a name for herself as the spokesperson for the “terror baby” menace, also introduced two other bills (one that would increase the penalty for driving without a license, and one requiring valid ID in order to vote) whose intent seems to be to take on immmigration indirectly. After a landslide election (the GOP gained 44 seats in the Texas house) and with the base so fired up that its leaders are literally squatting on the floors of the legislature, we can expect this to be an interesting session.